An urgent program to monitor unrest and to interpret the record of past eruptions at Mount Pinatubo led to remarkably accurate warnings of one of the largest eruptions of this century. Three cornerstones of the warnings were an interpretation of the origin of the unrest, a simple five-level warning scheme, and a hazards map based on a composite "worst-case" of prehistoric eruptions. Warnings were coupled with an intensive educational campaign to ensure that they were not only received but understood. Many lives were saved, as was much property. Declining unrest in late 1991 and renewed unrest in 1992 required revised warnings. Partly because of the major eruptions and life-saving success in 1991, it was easier in 1992 to raise concern and more difficult to moderate it. In hindsight, we should have been less concerned about overstating the hazard and more concerned about speeding preparations for evacuations. Pinatubo almost overtook us. We would also give stronger warnings about ash fall, especially in conjunction with typhoon rains, and we would modify our numerical alert scheme to be less specific about time windows and more specific about distinctions between large and small eruptions. Credibility is an especially difficult issue at volcanoes that have not erupted in recent history. In general, volcanologists will lack credibility unless and until the volcano erupts and proves them right, and then it is too late. Several items might help, including in-person or videotaped accounts by officials who averted or failed to avert volcanic disasters elsewhere. Most of the largest eruptions of this century have occurred in sparsely populated areas, and death tolls have been correspondingly low. In contrast, most of the deadliest eruptions of this century have been relatively small but have occurred in populated areas and have been deadly more by virtue of surprise than by size (Blong, 1984; Tilling, 1989). The most dangerous situation of all is that of a large, unexpected explosive eruption from a long-dormant volcano in a densely populated area (Simkin, 1993). As we struggled to understand the unrest and to warn of potential hazards at Mount Pinatubo in from April to early June 1991, we were acutely aware that premature or overstated warnings could lead to unnecessarily disruptive evacuations and serious loss of credibility for scientists--credibility that would be needed in case of true emergency. At the same time, we were acutely aware of how even small eruptions can lead to disaster (most recently, Nevado del Ruiz in Colombia in 1985; Hall, 1990; Voight, 1990). And, most worrisome of all, we could see from the geologic record of Pinatubo that its previous eruptions were so large that a recurrence would threaten several hundred thousand unsuspecting people. The ingredients for a colossal disaster were on hand. Fortunately, Pinatubo gave us a brief but unmistakable warning and, before the worst of the eruptions, more than 60,000 people heeded warnings and fled to safety. Of these, more than 20,000 escaped certain death. The death toll from the eruption itself was between 200 and 300. We grieve over these deaths but also breathe a collective sigh of relief that this toll was small compared to what would have occurred without our warnings. This paper describes warnings that were given before the eruptions of June 1991, the general philosophy and scientific basis for those warnings, and the complex socioeconomic and political context in which the warnings had to compete for the attention of those at risk. Our discussion includes questions that we were asking ourselves, or being asked by those at risk, in the hope that it might be a useful reference for those faced with similar situations in the future. In addition, this paper describes advice and warnings, regarding the possibility of further eruptions, that were given to public officials in the months and first 2 years following the climactic eruptions. Although earthquake swarms and growth of a new lava dome since July 1992 are minor in comparison to the high drama of April-June 1991, such swarms and dome growth remind us that the eruption might not be finished. Figure 1 illustrates the organization of disaster management in the Philippines. The National Disaster Coordinating Council (NDCC) is an umbrella body that is headed by the Department of National Defense (DND), and the Office of Civil Defense (OCD) is its administrative arm. Its members are agencies and organizations responsible for disaster warning, rescue, relief, and reconstruction. The Philippine Institute of Volcanology and Seismology (PHIVOLCS) became a member of NDCC in 1990 with responsibility for warning of earthquakes and volcanic eruptions. Parallel bodies exist at the regional (RDCC), provincial (PDCC), municipal (MDCC), city (CDCC) and barangay or village (BDCC) levels, but, because there are no counterparts of PHIVOLCS on these lower level bodies, PHIVOLCS staff are called to provide technical advice at all levels. Figure 2 is the preeruption flowchart for dissemination of Pinatubo warnings. PHIVOLCS was the source, and OCD, RDCC, the PDCC's, and the Philippine Air Force's Clark Air Base Command (CABCOM) were the first-level recipients of warnings. They, in turn, were charged with relaying messages to towns and various Philippine military groups, and the corresponding MDCC's were to pass warnings to barangays (villages) and to evacuation camps. Informally, the USGS team conveyed the same warnings to U.S. military commanders and the U.S. Embassy, and all of us conveyed warnings to local residents. The formal structures for decisionmaking and communications hide a much more complicated reality. Unlike Mayon, Bulusan, or Taal Volcanoes, where we had worked with one governor and one provincial staff, Mount Pinatubo was at the apex of three provinces (Pampanga, Tarlac, and Zambales, fig. 3). We had to work with three governors and three provincial staffs. In addition, we had to warn three large cities (Angeles, San Fernando, and Olongapo), several tens of smaller towns, U.S. and Philippine military bases, and hundreds of barangay (village) captains, minor officials, and nongovernmental organizations. Each of the three provinces speaks its own dialect, and the indigenous mountain people, Aetas, speak yet a fourth dialect. Two of the three governorships were in dispute, as was one important mayor's post, so we had to contend with local politics. Discussions between the Philippines and the United States over military bases were politically sensitive, and a guerrilla movement operated on Pinatubo itself. As a national election was approaching (May 1992), political decisions about Pinatubo precautions had to be weighed against electoral consequences. Other factors that complicated our efforts are noted in Punongbayan and others (1993). In short, our warnings passed into theoretically simple, well-established channels for civil-defense communication and decisions. These channels did work, but slowly, because warnings had to filter through a myriad of political, social, and economic interests. Figure 1. Organization of disaster management in the Philippines. Figure 2. Flowchart for communicating warnings of Pinatubo hazard, May 1991. Dashed line indicates a secondary line of communication. Council acronyms are defined in figure 1. Figure 3. The three provinces, large cities, and numerous towns and villages to whom warnings of volcanic eruption had to be disseminated. On July 16, 1990, a M 7.8 earthquake occurred along the Philippine fault, about 100 km northeast of the volcano (Punongbayan and others, 1991). In the weeks thereafter, numerous smaller earthquakes were felt by residents of the Pinatubo area. Some were undoubtedly distant aftershocks of the July 16 earthquake, but others were instrumentally located in the Pinatubo region. A few hours after the main shock, a M 4.8 earthquake occurred about 10 km southeast of Mount Pinatubo, and 5 other M>3 earthquakes occurred in the general vicinity of Pinatubo before the end of August (B.C. Bautista and others, 1991, this volume). In early August, Aeta people from the northwest side of Pinatubo, led by Sister Emma Fondevilla, reported to PHIVOLCS rumbling sounds, ground cracks, and a landslide covering about 2 to 3 ha on the upper northwest face of the volcano. A PHIVOLCS Quick Response Team sent to Pinatubo on August 5 noted steaming and a landslide on the extreme northwestern part of the volcano, in a long-known solfataric area. The PHIVOLCS team reported four steaming vents with yellow sulfur deposits, hot spring discharge at 45°C, and ground temperature of 89°C. Because steaming and thermal activity were normal for this area, the team concluded, rightly or wrongly, that the landslide was caused by aftershocks of the strong tectonic earthquake and heavy rains in the area. A memorandum sent on August 6 to the governor of Zambales Province, the mayor of Botolan town, and the provincial military commander stated that "Preliminary findings indicate that the phenomenon is not related with any volcanic activity . . . . The parameters necessary for deducing an approaching . . . volcanic eruption were not observed in the locality" (Ramos and Isada, 1990a). Local residents were reassured, despite the persistence of felt earthquakes weeks after the investigative team had left. A report to the Director of PHIVOLCS on August 10 followed an aerial survey on August 9 to map out the extent of the landslide; the report presented more details of the team's observations (Ramos and Isada, 1990b). New rumbling sounds and felt earthquakes in late March, and explosions and the opening of new steaming vents on April 2, brought Sister Emma back to PHIVOLCS on April 3. Another Quick Response Team was immediately created, and, with the cooperation of the Office of Civil Defense and the Philippine Air Force, it conducted an aerial survey and found all that had been reported, plus a fissure and new craters at the northeast end of the line of steaming vents. The team's initial thought was that the activity was purely hydrothermal. To determine the cause of these explosions, PHIVOLCS installed a portable seismograph the next day. About 500 earthquakes, some large enough to be felt at varying intensities at the temporary station, were recorded. Unable to say for sure whether the activity was purely hydrothermal or volcanic in origin, and whether it would culminate in a volcanic eruption, PHIVOLCS recommended a precautionary evacuation of villages within 10 km of the summit. The Department of Social Welfare and Development, together with several non-government organizations, established evacuation camps that quickly filled with about 5,000 Aetas. PHIVOLCS then set up additional seismographs, in a simple, nontelemetered seismic network, and established a base camp where visual observations could be conducted (Sabit and others, this volume). This initial seismic network, consisting of one analog seismograph and four digital seismographs, was installed on the northwest side of the volcano, where roads and unrestricted access were available. The digital instruments (which recorded data on disks that then had to be read and analyzed on playback units) were better suited for aftershock monitoring, where assessments and interpretation are done at a later date. Unfortunately, not much else could be done because these were the only instruments available at that time; other portable PHIVOLCS instruments were deployed at Taal Volcano, which was also restless at that time. During these early days, volcano bulletins were prepared in the field and contained daily earthquake counts and visual observations for the preceding 24-hour period. Each bulletin also included a judgment about the overall condition of the volcano. Unsure of whether to use a warning scheme previously used for other Philippine volcanoes, we initially used the term "unstable" to describe the volcano's condition. Draft bulletins were radioed to the PHIVOLCS central office for review and release. From PHIVOLCS' central office, these bulletins were relayed to the NDCC via OCD and faxed to the Office of the President and the Departments of Science and Technology and National Defense. Bulletins were also radioed back to volcano monitoring field stations for local dissemination. During the same early days of the Pinatubo crisis, PHIVOLCS and U.S. Geological Survey (USGS) geologists also began to compile what little was known about Pinatubo's geologic past. Hermes Ferrer and F.G. Delfin, Jr., of the Philippine National Oil Company and Mark Defant of the University of South Florida shared helpful knowledge of the geology and rock types of Pinatubo. With Taal Volcano also restless at the same time, PHIVOLCS asked USAID/Philippines to obtain the assistance of the Volcano Crisis Assistance Team (VCAT) of the U.S. Geological Survey. Two weeks were needed to assess the potential seriousness of the unrest, ready equipment, delay previous commitments, and obtain official concurrence and token funding from USAID. Those hurdles overcome, a three-person USGS team arrived in the Philippines on April 23, bringing with it a large cache of equipment that had been developed or purchased specifically for emergencies such as this. The new PHIVOLCS-USGS team immediately began to select sites for a network of radio-telemetered seismometers and a central recording base station. The team initially planned to work from a college or an apartment in Angeles City but changed its mind when the U.S. Air Force at Clark Air Base invited it to use Clark facilities and offered helicopter support. Given that the Philippine and U.S. governments were locked in negotiations over renewal of the bases agreement, and that Philippine government agencies were not generally allowed to operate on Clark Air Base, we were concerned that a move to Clark would compromise the political neutrality of our mission, be awkward for those of us from PHIVOLCS, and compromise the frequency or credibility of our interaction with other Philippine government authorities. However, the advantages of air support, other logistical support, communication facilities, ample housing and work space, and the fact that the USGS team could continue its work even though it was nearly out of money outnumbered the potential disadvantages, and we moved onto Clark on April 26. There, we created the Pinatubo Volcano Observatory (PVO) (Punongbayan and others, 1993), supplementing the temporary field station that had earlier been established on the northwest side of the volcano. In retrospect, our communication with local authorities did not suffer much, as PHIVOLCS' main office in Quezon City remained the central focus for such communications and we made frequent trips to the offices of those officials. Although USGS scientists heard of some suspicion that their warnings were intended to favor the Americans in the bases negotiations, or that they would provide information to the Americans sooner than to the Philippine government, the entire PHIVOLCS-USGS team made it a firm policy to remain strictly apolitical and to provide all volcano information first to the Office of Civil Defense and then to all other interested parties including the U.S. Air Force. An added bonus--one that we did not anticipate at the time but which helped all parties in the end--was that the PHIVOLCS-USGS team on Clark Air Base was largely isolated from the news media and thus could work on technical issues and keep the media focus properly at PHIVOLCS' main office in Quezon City. communicate this information far and wide, to awaken both the public and its leaders to the fact that a large eruption could (at this point, no one could say "would") occur. Each of these tasks is discussed below, prefaced by the main questions (in italics) that we were trying to answer. Before we could offer much more advice to local and military authorities, we had to understand the origins of the unrest. How frequently (if at all) did unrest like this occur at Pinatubo? How did this unrest compare to "baseline" activity of Pinatubo? Was the unrest hydrothermal, tectonic, volcanic, or some combination of these? If it was volcanic, what did the seismicity and other features of the unrest tell us about the likelihood and the likely date and magnitude of an eruption? Without prior monitoring of Pinatubo, we had no real knowledge of how often swarms of small, unfelt earthquakes might occur beneath Pinatubo. Neither did we have any way to check whether baseline seismicity varied with steaming in the known thermal area and (or) with the monsoon season. Aeta residents told us that nothing like this had happened within their memories or oral traditions, so, at least, we knew that the unrest was substantially greater than anything of the past several decades. If the unrest was of hydrothermal origin, we expected that all earthquake hypocenters would be shallow and that there would be minimal outgassing of SO2, because the stable sulfur species would likely be H2S. If the unrest was dominantly tectonic, it might be centered exclusively away from the volcano and release little or no SO2. If the unrest was volcanic, it could produce small earthquakes at various depths beneath the volcano, with or without significant SO2 emission at this stage. The first priority for the PVO team at Clark was to establish the telemetered seismic network (Lockhart and others, this volume; Murray and others, this volume). The availability of seismometers, computers, telemetry radios, and related equipment, collected under the cooperative Volcano Disaster Assistance Program of USGS and USAID's Office of Foreign Disaster Assistance, was essential to this task, as was the availability of software developed by VCAT and by W.H.K. Lee and others of the USGS and the International Association of Seismology and Physics of the Earth's Interior (IASPEI). By May 7, the net was providing hypocenters and other seismic information in near-real time. We found two groups of hypocenters, one at about 4 to 6 km depth about 5 km northwest of Pinatubo (potentially tectonic, but too deep to be hydrothermal) and another at shallow depth beneath the north flank of Pinatubo (potentially hydrothermal, volcanic, or tectonic). During this time, we worried that the large footprint of earthquake epicenters might indicate a large magma reservoir, but we also knew that similar widespread seismicity at Rabaul (Papua New Guinea), Long Valley (U.S.A.), and the Phlegraean Fields (Italy) had persisted for years without eruption. During May, we could not distinguish the seismicity recorded at those large systems from that which we were observing at Mount Pinatubo. To constrain our interpretations of seismicity, we needed measurements of SO2 emission, using a correlation spectrometer (COSPEC). Curiously, we had great difficulty in obtaining the use of a small, light plane for such measurements. Most military planes were unsuitable, and we lacked money to hire a private plane. Finally, on May 13, in desperation, we attempted measurements from a U.S. Air Force helicopter. Despite a terrible signal-to-noise ratio caused by interference from the helicopter's main rotor blade, we determined that about 500 t/d of SO2 was being emitted (Daag, Tubianosa, and others, this volume). From this we ruled out the tectonic explanation and tentatively ruled out the hydrothermal explanation as well. Magma appeared to be involved, and we interpreted a tenfold increase in SO2 emission over the following 2 weeks to indicate that the magma was also rising (Daag, Tubianosa, and others, this volume). Subsequent analysis has suggested an alternative explanation for increasing SO2 emission--boiling off of a hydrothermal system and thus progressively less absorption of SO2 gas--but this was not our thinking at the time. On May 19, we received a fax from an overseas colleague who had kindly analyzed data from the digital recorders used early in the crisis on the northwest side of Pinatubo. He judged that the earthquake swarm was similar to many tectonic swarms near arc volcanoes and geothermal areas, so he advised that "the swarm itself is not very dangerous, although close watching is necessary." Fortunately, we had several different data sets by that time, including that which showed high and increasing levels of SO2 emission, so we set aside the suggested interpretation. In the Philippines, where the advice of a foreign expert is accepted politely and often with deference, this interpretation without our additional data could have been disastrous. During the month of May, seismicity remained broadly constant, and SO2 emissions showed a clearly defined and essentially linear increase. In the absence of any significant increase in seismicity, we guessed that magma was rising at a slow, constant rate, and we did not know whether or when it would erupt. Would we be able to predict an eruption of Pinatubo with enough specificity and certainty for our prediction to be a reliable basis for evacuations? If not, how many levels of unrest did we think we would be able to distinguish, and could those be used by public officials to trigger evacuations and other precautions even in the absence of specific predictions? Because we had no baseline monitoring for Pinatubo, no information of any kind about the precursors of its previous eruptions, and practically no information about the precursors of eruptions as large as those apparent in the geologic record of Pinatubo, we concluded that we could not promise a specific prediction. We did, though, think we could offer a simple, multilevel description of unrest (table 1), and a five-level scheme was introduced on May 13, 1991. Modified from schemes used at Rabaul caldera, Redoubt Volcano (Alaska), and Long Valley caldera (California), and generalized in UNDRO-UNESCO (1985), this scheme did not technically make predictions but simply noted increasing levels of unrest and correspondingly decreasing assurances that an eruption would not occur within a specified time period. Phrasing like "eruption possible within 2 weeks" was chosen carefully to mean that unrest had risen to such a level that an eruption might occur within that period. Perhaps predictably, the mass media and the general public misread the intent of the wording and concluded, first, that an eruption would occur 2 weeks from the date of the warning, and later, after our explanation, that an eruption would occur sometime within the 2 weeks following the warning. The intended distinction between descriptions of unrest and predictions vanished. In retrospect, use of the Pilipino "ma'aaring mangyari" ("might occur") would have been clearer than the English "possible." Table 1. Five-level alert scheme for Mount Pinatubo, May 13, 1991. No eruption in foreseeable future. evidence for involvement of magma. Relatively high and increasing unrest including numerous b-type earthquakes; accelerating ground deformation, increased vigor of fumaroles, gas emissions. eruption possible within 2 weeks. Eruption possible within 24 hours. From Alert Level 4 to 3: wait 1 week. From Alert Level 3 to 2: wait 72 hours. Initially, the alert was placed at Alert Level 2 because of elevated seismicity, persistent felt earthquakes, rumbling sounds, and the possible recurrence of explosions like those of April 2, 1991. Even though many officials misunderstood the subtleties of the alert levels, they understood clearly that Level 3 was more serious than Level 2 and required urgent preparations, Level 4 was more serious than Level 3 and, for people living near the volcano, required evacuation, and Level 5 was as serious as we could get. Indeed, Level 5 was originally intended for large explosive eruptions in progress, but in our simplifications we omitted the words "large explosive," a fact that we regretted later when the eruption began with dome extrusion and relatively small explosive eruptions. One intent of the scheme was to provide a simple set of steps for which the Office of Civil Defense and military commanders could design corresponding response plans. Shortly after it was introduced, OCD, PDCC's, the U.S. Air Force at Clark and the U.S. Navy at Subic Bay, and CABCOM began to prepare contingency plans, each of which was loosely tied to alert levels. Most of the evacuations that were eventually ordered, including those of Aetas living on the lower flanks of Pinatubo and that of Clark on June 10, were based on this numerical scheme combined with hazard maps (described herein) and PHIVOLCS' recommendations of zones 10, 20, 30, and eventually even 40 km in radius from the volcano. The scheme included automatic stand-down procedures to ensure that the alert would be lowered when unrest decreased but not before the danger had truly passed. Many volcanoes exhibit increasing unrest until magma reaches so close to the surface that no further rock fracturing is required and (or) until late-stage degassing and a corresponding increase in magma viscosity temporarily halt the final ascent of that magma (Newhall and Endo, 1987). At this point, seismicity decreases, but the hazard remains as high or higher than ever. Delays were built into the stand-down procedures to guard against such "lulls before the storm." Details of how this scheme was applied are given later in the text for June 1991. One lesson bears mention here: schemes of this sort demand that one, and only one, person or consultative group has the authority for determining the level. This might have become a problem for us, because we were a distributed observatory with staff on both sides of the volcano and at PHIVOLCS' main office in Quezon City, and it was difficult to keep everyone's understanding of the changing state of the volcano exactly synchronous. However, the authority to issue alert levels lay solely with the Director of PHIVOLCS, in Quezon City, and eruptions overtook us before any differences of synchroneity could become a problem. On May 17, we reviewed the situation and possible scenarios with selected officials (the Administrator of OCD and commanders of Clark Air Base) through use of a probability tree (fig. 4). By this time, we had nearly eliminated nonworrisome tectonic and hydrothermal explanations, and the primary questions were whether the inferred magma intrusion would lead to an eruption, how large that eruption might be, whether pyroclastic flows would be restricted to the north and west or flow in all directions, and how far such pyroclastic flows might reach. The advantages of a probability tree were that it showed each of the possible outcomes, it showed the approximate relative likelihoods of each outcome, and it indicated fundamental points of uncertainty. The disadvantages were that it was too technical for most laymen to understand and that numbers (which were really subjective estimates) implied that we understood the situation better than we really did. Questions asked at the time suggested that it was readily understood by those to whom it was presented, but we do not know how (or whether) it was used in subsequent decisions. Figure 4. Probability tree for east flank Pinatubo hot ash clouds (pyroclastic flows), presented to Office of Civil Defense and Clark Air Base authorities to explain a range of possible origins and outcomes of the ongoing unrest (1-year timeframe). The probabilities indicated for individual events were subjective estimates based on our interpretation of unrest and our experience at other volcanoes. The probability of any of the outcomes at the right was the product of probabilities of each individual leg (expressed here as percent). It was explained that these estimates had high uncertainties and would change with new data and with changes at the volcano. Although most of our logistical support came from the U.S. command of Clark Air Base, we also sought out CABCOM because that group could serve as a critical communications link between the PVO team at Clark and the RDCC in San Fernando, via Armed Forces of the Philippines phone lines and radios. After the initial briefing on May 21, CABCOM assigned liaison officers to stay in close touch with our monitoring operations and also prepared a base contingency plan for Filipino officials and dependents (never actually activated) and a communication plan that would link various agencies that would be involved during an actual eruption. As it turned out, CABCOM was a supplemental rather than primary communications link between PHIVOLCS and the RDCC. What types and magnitudes of eruptions had occurred at Mount Pinatubo? How often had eruptions occurred, and how long had it been since the latest eruption? How often did large eruptions occur, and how long had it been since the latest large eruption? How far had prehistoric pyroclastic flows, lahars, and thick tephra falls reached into now-populated areas? To what extent did the location of steam vents on the north side of Pinatubo limit hazard to the north side of the volcano? In April 1991, only three radiocarbon ages were available for young Pinatubo volcanic deposits (Ebasco Services, Inc., 1977; see also Newhall and others, this volume). These ages--635+-80 yr, 2,330+-110 yr, and 8,050+-130 yr--had been the basis for classifying Pinatubo as an active volcano (Punongbayan, 1987; PHIVOLCS, 1988). However, to estimate recurrence frequency and the length of the latest repose, we needed--and found--charcoal in several pyroclastic-flow deposits. These samples were sent by air courier to the lab of Dr. Meyer Rubin, USGS, Reston, Va., who analyzed them immediately. Within a week of delivery, we had preliminary ages--imprecise because there wasn't time to allow radon decay in the lab but invaluable because we got them while we were still trying to answer the question of recurrence frequency. Before the major eruptions of June, we had five new ages--enough to suggest that the recurrence frequency was on the order of 500 to 1,000 years and that 500 years had already passed since the latest eruption (ages are listed in Newhall and others, this volume). We didn't have enough data to say that Pinatubo was "overdue," or "not due yet," but we did have enough to say that an eruption was entirely plausible. Because these samples came from the east side of the volcano, where the pyroclastic fan was less prominent than on the north, west, and southwest, the ages also suggested that all eruptions sent pyroclastic flows down all sides of the volcano. The next question was, how large and extensive might this eruption be? In our reconnaissance, we aimed only to define the major types of deposits and the outer limits of each. No attempt was made to distinguish any but the youngest deposits on maps; all other unconsolidated, relatively fresh-looking deposits were lumped into one unit and treated as products of a "worst-case" eruption. Although we worried that use of a composite "worst-case" might overstate the hazard, we opted to err on the side of safety. All of the prehistoric eruptions that we could recognize had been big, and we had no basis from the monitoring to argue that this eruption would be smaller than the norm for Pinatubo. In fact, during days of great uncertainty in May, we often told officials that we didn't know whether or when Pinatubo would erupt, but we did know that if it erupted, the eruption would almost certainly be big and serious. Our mapping was a very hurried operation with two parts, aerial-photograph interpretation and field checking, and we did those in between the press of monitoring and public meetings. Typically, we would squeeze an hour or two per day of field geology into the schedule, taking hasty notes at only the most complete, best-exposed stratigraphic sections, and looking for charcoal by which we might get some idea of recurrence frequency. The paleomagnetic vectors of clasts in diamicts were checked in the field for consistency to help us distinguish between pyroclastic flows and lahars (Hoblitt and Kellogg, 1979). One of us (R.S. Punongbayan) did the aerial-photograph interpretation; others checked questions from the aerial-photograph interpretation and did reconnaissance traverses down major river channels, especially near the outer limits of pyroclastic-flow deposits. Most work on the ground was on foot; a few outcrops were reached by helicopter. We also took advantage of helicopter trips to and from monitoring sites to supplement our impressions from aerial photographs, topographic maps, and ground traverses. The aerial-photograph interpretation was generally consistent with ground observations, and by May 23 we released a preliminary hazard map (fig. 5). Figure 5. Hazard map distributed to provincial authorities beginning on May 23, 1991. All three major hazards-pyroclastic flows, ash fall, and lahars-are shown on this single map. Ash-fall hazard is not adjusted for prevailing winds. Question marks along the Gumain River reflect uncertainty about whether pyroclastic flows had jumped a high ridge near Mount Pinatubo to enter the drainage. In addition to the conventional aerial-photograph interpretation and field traverses, we also used a local industry--mining of pumice blocks--to help us find pyroclastic-flow outcrops. We could drive along roads, spot telltale sacks of pumice piled by the side of the road awaiting pickup, and find the outcrops nearby. One group of deposits gave us special pause. Poorly sorted flowage deposits with clasts that showed partially coherent paleomagnetism were interpreted as deposits of either hot lahars or relatively cool pyroclastic flows. These deposits occurred just downslope from unequivocal pyroclastic-flow deposits, in Porac and along both the north and south sides of Clark Air Base, well into densely populated areas. Because these deposits flanked Clark Air Base, we informed base officials that there was a chance (small, but not zero) that the base would be swept by pyroclastic flows or hot lahars, either of which would be deadly. In maps, we addressed this uncertainty, and the possibility of ash-cloud surges no longer represented in the geologic record, by adding a 1- to 2-km-wide buffer zone around the known extent of prehistoric pyroclastic flows. An internal suggestion at PVO to increase this buffer to 3 km was under consideration when the eruptions began. In retrospect, an even wider buffer zone (5-10 km) would have been needed to protect against surges associated with the largest eruptions of Pinatubo's history (see Newhall and others, this volume). This hand-sketched map, complete with question marks, was photocopied and distributed to officials in Pampanga province during a briefing on May 23, 1991. A properly drafted copy of this map, in three sheets, was provided on the same day to President Corazon C. Aquino and her cabinet, including then-Defense Secretary and Chairman of the National Disaster Coordinating Council (NDCC), Fidel V. Ramos. A copy of this map was also printed in the Philippine Star after the Pampanga briefing but attracted little notice. 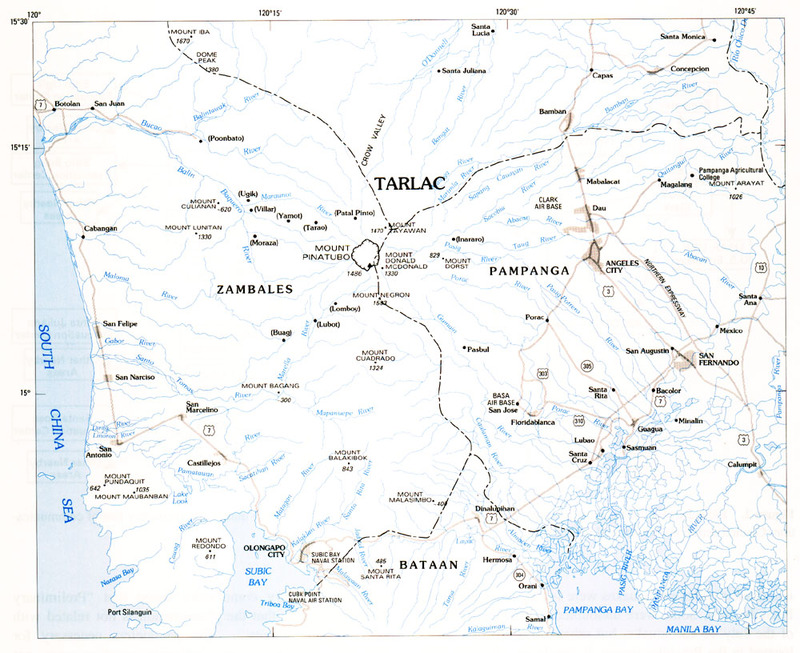 The map was presented to Tarlac officials on May 27 and would have been presented to Angeles City officials on the same day had they attended a scheduled meeting; on May 28, PHIVOLCS and USGS scientists presented the map and a briefing to Zambales officials and concerned residents in Iba. On or about June 3, one of us (M.L.P. Bautista) gave a similar briefing to Angeles City officials and was in contact with those officials for the balance of the preeruptive period. The cleanly drafted version differed from the sketched version in one significant aspect: the sketched version showed ash-fall hazard throughout the area, without regard to statistically prevailing winds; the cleanly drafted version limited ash-fall hazard to two lobes within which ash fall was most likely, based on prevailing winds (fig. 6). The sketch map was disseminated in Disaster Coordinating Council meetings from the regional down to the barangay levels, while the cleanly drafted map was disseminated at the national level including national media. We mention this discrepancy as a two-part caution to future workers. First, differences in hazard maps will confuse users. Second, representations of prevailing winds are valid as statistical probabilities, but winds on any single day of eruption can be different. Winds on the days of the eruptions made statistically unlikely sectors hazardous and many people who unexpectedly received ash fall concluded that the cleanly drafted map was wrong. We recommend against showing wind patterns by asymmetry of zones on a hazard map; a wind rose diagram in the text or margin of the map can convey the necessary information. Figure 6. Ash-fall sheet of three-sheet hazard map issued by PHIVOLCS in late May 1991. Lobate areas are those most likely to be affected by ash fall, assuming normal prevailing winds. Both versions of the hazard map showed expected lahars along the main rivers draining Pinatubo, and residents of Sapangbato, Taconda, and other barangays along the Abacan River received direct briefings about the potential syneruptive lahar hazard. Neither map attempted to show the full area of the alluvial fans over which lahars might spread. Many populous towns and cities were built on these fans and, given the breadth and very gentle slopes of these fans, we had no simple way to know which of these towns, if any, were at high risk (see also, Janda and others, this volume). Until a typhoon approached Luzon just as Pinatubo was building toward its climactic eruption, lahars were of less concern to us than pyroclastic flows. In retrospect, we should have drawn more public attention to the hazard of syneruptive lahars, though we are not sure that these densely populated lahar-threatened areas could or would have been evacuated. U.S. Air Force officials took a keen interest in a wall-size working copy of our hazard map, because they could see that Clark Air Base was right at the edge of the pyroclastic-flow hazard zone (fig. 5). There was, in effect, no margin of safety for the base. They also asked about tephra fall, as it might affect aircraft and other high-tech equipment, and about whether mudflows might affect the base or an evacuation to Subic Bay. Both ash fall and mudflows were possible and, indeed, likely. Given our five-tiered warning scheme and the preliminary hazard map, how well did officials and the public understand the dangers that they faced? If the answer was "little," as we feared, how could we explain these hazards clearly enough that officials would order, and residents would accept, evacuations and other necessary precautions? How could we be forceful enough in our warnings that skeptics would pay attention yet not cause undue panic or overreaction and, sooner or later, destroy our still-limited credibility? How could we convey the large uncertainties in our warnings, including the possibilities for both false alarms and unpredicted eruptions, without destroying that same, tenuous credibility? The tragedy at Nevado del Ruiz, Colombia, occurred because a perfectly good scientific identification of hazard was poorly understood or not believed by key officials, who were accordingly slow to order precautions (Hall, 1990; Voight, 1990; Mileti and others, 1991; Peterson and Tilling, 1993). We were determined that such a tragedy would not be repeated, but we, too, faced a skeptical public (Tayag and others, this volume). Helpful tips to increase the credibility and effectiveness of warnings and thus prevent repetitions of the Nevado del Ruiz tragedy are available (for example, Sorensen and Mileti, 1987; Mileti and others, 1991), and we subconsciously attempted to follow lessons from that research. Frankly, though, it was difficult to ponder the most effective style of warnings when we were still struggling to anticipate the volcano's activity. Our fieldwork attracted many curious residents. When told that we were studying deposits from the volcano, their usual reaction was disbelief that any volcano existed in their backyard, much less one that might erupt. Our briefings for government officials attracted many who wanted to do the right thing for their constituents but who found it difficult to even imagine the problem. Terms like pyroclastic flow (or even hot ash flow or hot blast), mudflow, and ash fall were completely new and meant little to them. Some government officials were not sure whether to believe heretofore unknown geologists. We thought briefly about inviting officials and residents from more recently active volcanoes, like Mayon or Taal, to speak to Pinatubo groups, but no invitations were actually made. In retrospect, this was probably fortunate, because the problems at Pinatubo dwarfed those that visiting officials might have described. Fortunately, we had an advance copy of a video entitled "Understanding Volcanic Hazards," produced by the late Maurice Krafft for the International Association on Volcanology and Chemistry of the Earth's Interior (IAVCEI). This video, made in response to the tragic misunderstanding and disaster at Nevado del Ruiz, shows graphic examples of hot ash flows, ash fall, volcanic mudflows, large volcanic landslides, volcanogenic tsunami, lava flows, and volcanic gases. Superb, sometimes shocking, footage and a simple text illustrate the nature of each phenomenon, how fast and far it travels, and its impact on people and houses. Knowing the principal hazards of Pinatubo, we showed sections of the video on hot ash flows, ash fall, and mudflows to as many audiences as we could reach--ranging from then-President Aquino, then-Secretary of Defense Fidel Ramos and other Department Secretaries, to Governors, the chief of the RDCC, military base commanders, local officials, students, teachers, religious leaders, and barangay residents. We made perhaps 50 copies of the tape and left a copy with each group that we briefed; an untold number of second-generation copies was made. Initial response to the tape was typically shock and disbelief or denial. However, slowly but surely, the tape did convert some skeptics, and people did start to plan for a possible eruption. One of our colleagues expressed concern that the video showed only dramatic, relatively large-scale examples and thus might have overstated hazards. We, too, were concerned about overstating hazards, but we judged then (and still judge) that strong images were needed to awaken people to the danger. In fact, our concern about overstating hazards led us to refrain from showing this video on broadcast television (except for a short segment that was shown too early in the crisis to catch anyone's attention); in retrospect, we wish we had sought broadcast time as alert levels were raised and the eruption neared. We also made photocopies of technical reports about the potential impacts of ash on aircraft--both civilian and military--and on agriculture, public health, computers, electrical power systems, and other facets of daily life. Most of these reports were based on experience at Mount St. Helens and, in the case of aircraft, also experience from Indonesia and Alaska. Copies were given to all who asked questions, including OCD officials, a provincial health officer, and commanders at Clark Air Base and Subic Bay Naval Station. Distribution of these reports was not as wide as it might have been; ideally, one volcanologist should have been assigned to do nothing but disseminate technical information about likely impacts of an eruption. We also had to ensure, somehow, that information and warnings we were disseminating to higher government and military officials were also being received by residents of villages on and around the volcano. A number of villages were outside the recommended evacuation zone but within or near the buffer zone for pyroclastic flows and near possible mudflow channels. In these places, we conducted an intensive information campaign that included showing the IAVCEI video and answering all questions posed by the groups. On the west side, PHIVOLCS staff were living in one of these villages and answered questions day and night. Although it would have been impractical for volcanologists to live in all of the villages at risk, there is no doubt that such arrangements greatly improved an educational campaign in those villages that were reached. To reach further, the education campaign enlisted the national and local media. PHIVOLCS staff in the main office, and the PHIVOLCS field team in Zambales, were followed by persistent radio, print, and TV reporters who wanted to "scoop" each other. As might be expected, news reporting tended to the sensational and, at times, inaccurate, but it was certainly a key factor in rapid dissemination of volcano information to large numbers of people. Two television interviews featuring PVO staff had more substance than most. One, on the Far East Network (FEN) on May 27, was aimed at U.S. military personnel and their dependents but was widely viewed by Filipinos throughout the area. It described the hazards briefly, the monitoring in more detail, and sought to reassure viewers that they would be warned if the situation became critical. At the time, we told viewers the situation was not yet critical. The second interview, on Manila TV the following evening, reached an even wider audience and explained the causes of the unrest, and potential hazards, as we knew them at the time. When unrest began to escalate only a few days later, Manila TV stations carried updated interviews with PHIVOLCS scientists, but FEN did not. Two groups that might have helped with the public-education campaign were only barely reached: teachers and clerics. Although we spoke at a few schools, and to a special gathering of teachers on Clark Air Base, we ran out of time before talking to groups of teachers from the Department of Education and Culture (school was still in its summer recess) and groups of clerics. We recommend that in future crises, such groups be brought into the public-education campaign early. The issue of credibility was a difficult one. Residents and their leaders were understandably skeptical about phenomena that they had never seen and that they either could not or did not wish to imagine. Furthermore, we as scientists were largely unknown to those at risk. We were suspected of various faults, chiefly ignorance and utter foolishness, but also of trying to make sensational headlines, pursuing an academic agenda cloaked in concern, conducting counterinsurgency reconnaissance, being dupes of the U.S. military, raising funds for our agencies, land-grabbing, and more. Some unknown persons or groups also used PHIVOLCS' name during this time to fraudulently seek relief goods. Such distractions might have been ignored were it not for the urgency of convincing skeptics, especially those in positions of leadership. We did not want to close minds through unduly aggressive messages; neither did we want to be so meek that we were ignored. One leader who did take us seriously urged us to convince skeptics with data. That worked for a few technically conversant skeptics; it didn't work for others. We tried various approaches--convincing people with data and with scientific reasoning, building personal rapport and trust, relating our experiences from other volcanoes, rotating the job of briefings so that officials heard more or less the same story from different people, advertising our concerns through the media, and raising issues of political if not legal liability. One approach that we did not try at Pinatubo but recommend for future crises would be to arrange in-person or videotaped accounts from leaders who had either averted or failed to avert a major volcanic disaster elsewhere. Examples could include Mont Pelée (1902; using readings), Mount St. Helens (1980), Nevado del Ruiz (1985), and Mount Pinatubo (1991). A mayor talking to another mayor is more effective than a scientist talking to a mayor. The issue of uncertainty compounded the problem of credibility. We recognized large uncertainties in our assessment of the unrest but knew that too much mention of uncertainty would be mistaken for incompetence in the crisis situation. Even when we set aside strict scientific rigor, it was not until early June that we could make a categorical statement that Pinatubo would erupt (Harlow and others, this volume); until then, we weren't sure that it would erupt, and we didn't want to "cry wolf" lest we lose credibility that might be needed in the following months. Therefore, we stated uncertainties for those who could appreciate them, and we glossed over them for those who wanted only our "best guess." Most with whom we spoke wanted our best guess, partly because they believed a scientist would surely know the facts and not issue a false alarm and partly because they had no easy way to factor uncertainty into their decisionmaking process. In the FEN interview of May 27, one of us (C.G. Newhall) noted uncertainties about future events, including the chance of a false alarm, and yet was chided by colleagues for being too optimistic about our ability to predict an eruption and was chided by officials for being too "wishy-washy." Perhaps equal chiding from both directions meant that a prudent balance had been achieved? Ultimately, the matter of credibility would be resolved by the volcano itself. By the end of May, an eruption still did not appear to be imminent, and we could say little or nothing about how much longer this unrest could continue before escalating or dying off. However, over the next several days, shallow seismicity and the amount of ash in the steam plume gradually increased. On the evening of June 3, we discussed raising the alert from Level 2 to Level 3 because of the change in seismicity and ash emission and because SO2 emission had reached a high level by the end of May. However, Pinatubo had been "teasing" us for weeks, and we decided to wait to see if these ash ejections would become more persistent and if earthquake hypocenters would become shallower. "Exercise Pinatubo. Dry Run 1 (or 2 or 3) (meaning Alert Level 3 or 4 or 5). This is an exercise." This was to test if the communication linkup between agencies would work if PHIVOLCS/PVO were to activate this message, but the test was never made, as events overtook our efforts. On June 5, increasing seismicity, an ominous, sudden decrease in SO2 emission, gradually increasing ash emission, and a (false) report of a new lava spine prompted us to raise the alert to Level 3, indicating that an eruption was "possible within 2 weeks." However, the warning also acknowledged the possibility that we might have to back down to Level 2. About 10,000 Aetas, including some who had earlier evacuated but then returned home, moved from their homes high on Mount Pinatubo into the evacuation camps located in safer areas. On June 6, for their own safety and as an example, the PHIVOLCS team moved from Yamut, 7 km from the summit, to Poonbato, 22 km from the summit. On June 7, further increases in seismicity, including seismic events that suggested dome growth or shallow intrusion, prompted us to declare Alert Level 4, meaning that an eruption was possible within 24 hours. A dome was confirmed the following morning. At this point, we began to question the wisdom of the five-level alert scheme, because dome growth was, technically, an eruption in progress. Twenty-four hours after declaration of Alert Level 4, an explosive eruption had still not occurred, and pressure on the team of scientists built as the news media and others complained that the "prediction" was wrong. One military commander misinterpreted Alert Level 4 as meaning that they had 24 hours in which to evacuate Clark Air Base; scientists and other commanders corrected the misunderstanding. Raising of the alert level from 2 to 3 and then to 4 forced the RDCC, PDCC's, and the commanders of Clark Air Base and Subic Bay Naval Station to sharply accelerate their contingency planning. Within days, plans were to emerge that would help these officials to conduct relatively rapid evacuations and to anticipate and prepare for blocked transportation routes, interruption of electrical power and telephone service, and other impacts, even though there was not time to prevent them. From Clark Air Base, early evacuation was ordered for hospital patients who required more time and care than would be available in a general evacuation. On June 9, when the monitoring team in Zambales reported the (false) sighting of a pyroclastic flow, the alert level was raised to 5, because to the observers the eruption certainly seemed to be in progress. Subsequent aerial reconnaissance indicated that the Zambales team had witnessed a ground-hugging pyroclastic density current rather than a true pyroclastic flow (Sabit and others, this volume; Hoblitt, Wolfe, and others, this volume), but the decision to raise the alert level to 5 had been made and released. In hindsight, even though the identification of the pyroclastic flow was in error, elevation of the alert level to 5 was an important factor in convincing more people to flee before the large eruptions actually began. This increase to the highest alert level triggered even wider evacuations of Aeta villages than had already taken place, and one of the evacuation camps, Ugik, was moved even farther from the volcano (from Ugik to Poonbato) after we advised OCD that Ugik was situated within reach of possible pyroclastic flows. By this time, about 25,000 people, mostly Aetas, had been evacuated to safety. On June 10, 14,500 U.S. personnel and their dependents were evacuated from Clark Air Base to Subic Bay Naval Station, and only a skeleton security force and the CABCOM personnel were left behind. The decision to evacuate Clark was courageous, because the economic and political price of leaving the base would surely be high. The mayor of nearby Angeles City said "they [the Americans] are overreacting" and "causing panic" (The Washington Post, June 11, 1991; The New York Times, June 12, 1991). Also on June 10, three eruption scenarios were discussed within the scientific team and informally shared with concerned parties around us. A scenario in which a plinian eruption would occur and send pyroclastic flows only to the northwest was judged to have a "high" probability; the occurrence of an even larger eruption, in which pyroclastic flows would cross a topographic divide and also flow to the east, was judged to have a "moderate" probability. The possibility that dome growth and small explosions might continue for weeks to years before grading into a plinian eruption was also given a "moderate" probability. This was a stressful time for the small team of PVO scientists. We were concerned about the volcano and the safety of those around it, including ourselves. We were also concerned about the serious consequences of a false alarm and whether we would have a second chance should the volcano not erupt as anticipated. Sleep was difficult, nerves were taut, and we were at our physical and emotional limits. We supported each other as best as we could with encouragement and humor. Lastly, we were concerned that the observatory should not have to move during an eruption, so on June 10 we moved our monitoring operations 5 km, from the center to the eastern edge of Clark Air Base. Our move to the east edge of the base was not planned as a strategy to overcome lingering skepticism, but it may have had that beneficial effect. Looking back, we realized that the time windows we set in the alert level scheme were too limiting. Much later, after the 1992 eruption, we would change the terms "2 weeks" to "days to weeks," "24 hours" to "hours to days," and "eruption" to "large explosive eruption." Details of the scientific reasoning behind each increase in alert level are given by Harlow and others (this volume) and Daag, Tubianosa, and others (this volume). As soon as large explosive eruptions began on June 12, the volcano spoke mainly for itself. Few additional warnings were required. However, as the number and magnitude of long-period earthquakes increased dramatically during this period, we continued to warn that "the big one is yet to come." This judgment was presented during emergency briefings of the NDCC and RDCC and was widely reported in the national news (for example, Manila Bulletin, June 13, 1991). Formal warnings during this period to the aviation community are documented in Casadevall and others (this volume). On June 14, warnings were issued about the likelihood that an approaching typhoon (Yunya) would blow ash in many directions, not just those shown on the hazard map (see fig. 6). An aviation advisory issued at 1452 on June 14 warned that "...Yunya ... will invite volcanic ash to move southeast to Manila from Mt. Pinatubo" (Casadevall and others, this volume). Similar warnings were given informally to various officials. Unfortunately, few of these warnings stressed the danger of added weight of ash when wetted by the anticipated typhoon rains and that roofs would likely collapse. Other, better publicized warnings noted that lahars would be likely (Manila Bulletin, June 14, 1991). By day's end on June 14, 45,000 to 50,000 people were in evacuation camps, in addition to the 14,500 who had moved from Clark Air Base to Subic Bay Naval Station. The zone of pyroclastic-flow hazard was entirely evacuated except for a handful of people who refused to leave; other, more distant villages were also evacuated, some on orders from the government and some on their own accord, out of fear about the volcano or desire to obtain relief food. The climactic eruption occurred on June 15 and is described by several papers in this volume. The area swept by pyroclastic flows was very nearly that anticipated on the hazard maps. Lahar paths were also correctly anticipated by the hazard maps, except along the Abacan River. The most serious shortcoming of our warnings was that, even though the hazard maps anticipated ash fall, we treated it more as a nuisance than as a deadly hazard. We did not give adequate warning that the accumulated ash would be much heavier than expected because of rain from the typhoon and did not anticipate that roofs which were already burdened by ash would be strained even more by earthquakes during the latter stages of the eruption. About 180 people were killed by roofs that collapsed under the weight of wet ash; another 50 to 100 people died from various other causes, including several tens from pyroclastic flows and another several tens from lahars. As eruptions from June 12 to June 15 had grown larger, PHIVOLCS had recommended progressively larger radii of evacuation. Until June 7 the recommendation stood at 10 km; at 1830 on June 7, the Zambales provincial government ordered evacuation on the west side of Pinatubo to a radius of 20 km. On June 9, together with its declaration of Alert Level 5, PHIVOLCS increased its recommendation for evacuation to 20 km radius on all sides of the volcano. On June 14, PHIVOLCS increased the radius to 30 km, and at 2000 on June 15, during the height of the climactic eruption, PHIVOLCS increased it yet again to 40 km. Even though the 40-km declaration was made primarily out of concern about pyroclastic flows and a lateral blast, it got many people out of their houses (where they would have been subject to roofs collapsing under ash fall) and onto the road and thereby saved some lives. Readers might ask why evacuations were of circular areas of specified radii rather than of areas known from the hazard map to be at risk from pyroclastic flows and lahars and perhaps the worst of the ash fall. Did circles not ignore our own hazard map? The answer is not simple. Traditionally, PHIVOLCS has recommended evacuations around volcanoes based upon a radius from the volcano's summit. In a crisis situation, it is easier to use a familiar procedure than to develop new ones. In addition, officials and the general public really didn't understand the nature of the hazards or hazard maps well enough to be confident that they were evacuating the right areas. Mr. Armando Duque, director of the Office of Civil Defense for Region III, told us that a radial hazard zone, scribed by a pencil on a string, would be the easiest zone to understand and implement. Furthermore, as the size of the eruption escalated and the typhoon and wet ash fall became a major concern, hazard zones on the maps that we had distributed in late May could not be readily expanded or otherwise changed. Circular evacuation zones could be easily expanded and seemed to be the only other option. The advantages of using the circles are noted above; the disadvantages were that some persons who would better have stayed at home to clean their roofs fled unnecessarily and that other persons who were truly in high-risk areas were unable to evacuate because transportation resources were spread too thinly. How much longer would low-level eruptive activity persist? Might there be another "big one"? How will it be possible to know when the eruption is finished? Psychological trauma from the June 15 experience, exacerbated by the fact that many earthquakes of magnitude 3 to 5.7 were occurring as "aftershocks" of the June eruptions, kindled fears of further eruptions. The PHIVOLCS-USGS team advised that eruptions could continue "for several years" but that it was unlikely that any new eruption in this episode would be as large as that of June 15. This advice was based on an analogy with Mount St. Helens, 1980-86. Later, a review of the duration of other large eruptions (E. Santistevan, U.S. Geological Survey, unpub. data, 1991) led us to realize that very large eruptions like that of Pinatubo tend to be relatively short lived. However, there are enough instances of eruptions that continued for years that we opted not to change our advice. Also, secondary explosions and lahars were guaranteed to occur. The last eruption of 1991, a small explosion, occurred on September 4, the same day the alert level was lowered from 5 to 3 and the 20-km-radius danger zone was reduced to 10 km in radius (Sabit, 1992). On December 4, 1991, the eruption alert was lowered to Alert Level 2, but the 10-km-radius danger zone was retained, on account of secondary explosions. Seismic swarms and tremor beginning on July 3, 1992, prompted PHIVOLCS to raise the alert level to 3 on July 6. On July 8 or 9, small phreatic explosions began to build a small tuff cone in the caldera lake. On July 14, rising magma finally reached the surface and a dome began to grow. Although not hazardous by itself, the dome growth was technically an eruption. In an internal debate, comparisons were drawn between long-period earthquakes, declining sulfur dioxide emission, and dome growth in early June 1991 (which were followed by the large explosive events) and similar, though not identical, earthquakes, similarly declining but smaller absolute values of SO2 emission, and dome growth of the moment. None of us expected a repeat of the 1991 activity, but the apparently low-frequency character of earthquakes and the presence of a lake in the caldera required careful watching. The alert level was raised directly from 3 to 5 on July 14. Dome growth continued until October 30 (Daag, Dolan, and others, this volume; Ramos and others, this volume). In retrospect, the decision to declare Alert Level 5 for dome growth proved to be awkward (Tayag and others, this volume). Seismicity remained high, and the dome grew rapidly for several months, so the alert level was kept at 5. However, residents of the area could see nothing: as far as they were concerned, Pinatubo was not erupting. Because this was also the rainy season, heavy rains and lahars would often trigger secondary explosions on the lower slopes, which look to the untrained eye like eruptions from the volcano. However, when asked whether these secondary explosions were the subject of Alert Level 5, PHIVOLCS had to answer "no." Worse than the awkwardness, however, keeping the alert level at 5 through the next several months probably eroded some of the high level of credibility that we had earned in 1991. This experience of 1992 raised once again a shortcoming of the original 5-level alert scheme, namely, that it was designed for the early parts of a volcanic crisis, building up to a large explosive eruption, and that it is less appropriate for periods of prolonged low-level or declining activity. A revision of the original scheme was therefore undertaken (table 2), and instituted on December 9, 1992, at which time the alert level was lowered back to 2. In it, dome growth and other small-scale eruptive activity triggers only Alert Level 4, and Level 5 is reserved for large explosive eruptions--as originally intended but not clearly written! Table 2. Five-level alert scheme for Mount Pinatubo, as revised on December 9, 1992. Low-level seismic, fumarolic, or other unrest. Moderate level of seismic or other unrest with positive evidence for involvement of magma. Relatively high unrest including numerous b-type earthquakes, accelerating ground deformation, increased vigor of fumaroles, gas emissions. New or renewed eruption possible, probably within days to weeks. Intense unrest, including harmonic tremor and (or) many "long-period" (low-frequency) earthquakes and (or) dome growth and (or) small explosions. Magma close to or at the Earth's surface. Large explosive eruption likely, possible within hours to days. Hazardous explosive eruption in progress, with pyroclastic flows and (or) eruption column rising at least 6 km above sea level. Large explosive eruption in progress. Hazards in valleys and downwind. From Alert Level 5 to 4: wait 12 hours after Alert Level 5 activity stops. From Alert Level 4 to 3 or 2: wait 2 weeks after activity drops below Alert Level 4. From Alert Level 3 to 2: wait 2 weeks after activity drops below Alert Level 3. Note: Ash fall will occur from secondary explosions for several years after the major 1991 eruption, whenever rainfall and lahars come in contact with still-hot 1991 pyroclastic-flow deposits. These secondary explosions will occur regardless of alert level. In February 1993, earthquakes and tremor were followed by small explosions in water-saturated sediments south and north of the 1992 dome. Renewed harmonic tremor on February 25, 1993, prompted us to raise the alert level to 3 on February 27, where it remained until lowered back to Alert Level 2 on May 12, 1993. Continued quiet allowed the alert level to be lowered to 1 on January 5, 1994, but renewed seismicity shortly thereafter forced us to raise it from 1 to 2 on January 19, 1994, and from 2 to 3 on February 11, 1994. On June 6, 1994, we lowered it again from 3 to 2, and on July 27, lowered it again to Alert Level 1. In general, Pinatubo is showing a gradual decline of activity, consistent with depletion of volatiles in the magma reservoir, but further dome growth is possible, indeed, likely, and even explosive eruptions remain possible. However, most of our warnings and concerns in the period since June 15, 1991, have been about lahars and are discussed in a separate paper (Janda and others, this volume). Hazards assessments and warnings issued by PVO before the giant June 15, 1991, eruption succeeded in saving many lives and much property. Much credit goes to the PVO staff--on both sides of the volcano and in Quezon City--who worked long hours under difficult conditions. Cooperation from civil-defense and local officials was also critical; without their willingness to order emergency planning and precautionary evacuations, our warnings would not have been effective. Credit is also due to Pinatubo itself, which followed a remarkably straight and rapid course toward eruption, giving fair warning and avoiding false alarms. Lest readers get the mistaken impression that we had everything firmly in control, we reiterate that the assessment of unrest and hazards at a long-dormant, newly awakening volcano is fraught with difficulties. A large amount of equipment had to be taken to Pinatubo and deployed rapidly. Only the availability of the USGS/VCAT equipment cache, availability of IASPEI and other data-processing software, and availability of expertise in their use made this task possible. Even after the modern equipment was in use, many of our conclusions were tentative, based on only sketchy data and hasty scientific review. We did not know how much time we might have before an eruption, so we hurried to compile a minimum package of data and recommendations, with the plan that these could be refined if time permitted. There was no extra time. On June 3, only a few days after we completed this package, unrest began to escalate. On June 6 unrest escalated further, and only then were we confident that Pinatubo would erupt soon. The major explosive eruptions began only 6 days later, on June 12. Our warnings, and emergency preparations by civil-defense and other officials, were barely one step ahead of Pinatubo. For dealing with future volcanic crises, we recommend most of the steps that we took. Each was critical and effective. If we had the chance to correct our mistakes, we would give stronger warnings about ash fall, especially in conjunction with typhoon rains and strong earthquakes during caldera formation, and we would modify the numerical alert scheme to be less specific about time windows and more specific about distinctions between large and small eruptions. We would present a documented worst-case scenario, as we did, but would add a margin of safety to cover the unseen and the unexpected. We would also ask that public officials and military commanders who were converted from skeptics to believers at Pinatubo help us address skeptics at the next such crisis. We gratefully acknowledge those who provided funding or in-kind support for our joint PHIVOLCS-USGS effort. Direct funding was from the Government of the Philippines' Departments of National Defense and Science and Technology, the U.S. Geological Survey, USAID/Office of Foreign Disaster Assistance (Volcano Disaster Assistance Program), USAID/Philippines, and later from the U.S. Department of Defense and UNESCO/ROSTSEA. In-kind support, including hundreds of hours of helicopter time, came from the Philippine Air Force, the U.S. Air Force, the U.S. Navy, and the U.S. Marine Corps; USAID/Philippines supplemented our vehicles and drivers with their own. We also had the privilege to work with some exceptionally receptive and responsible public officials and military commanders. Four who merit special recognition are Engr. Fortunato Dejoras (Administrator of the Office of Civil Defense), Gen. Pantaleon Dumlao, Jr. (Chairman, Regional Disaster Coordinating Council, Region III), and Col. John Murphy and Col. Bruce Freeman (U.S. Air Force). We also want to acknowledge, posthumously, the enormously important contribution of Maurice and Katia Krafft. As explained in this paper, they made a videotape of volcanic hazards that was invaluable in convincing officials and residents to take Pinatubo seriously. Bautista, B.C., Bautista, M.L.P., Rasdas, A.R., Lanuza, A.G., Amin, E.Q., and Delos Reyes, P.J., 1991, The 16 July 1990 Luzon earthquake and its aftershock activity, in The July 16 1990 Luzon earthquake: A technical monograph: Manila, Department of Environment and Natural Resources, p. 81-118. Blong, R.J., 1984, Volcanic hazards: A sourcebook on the effects of eruptions: Sydney, Academic Press, 427 p.
Casadevall, T.J., Delos Reyes, P.J., and Schneider, D.J., this volume, The 1991 Pinatubo eruptions and their effects on aircraft operations. Ebasco Services, Inc., 1977, Philippine Nuclear Power Plant I, Preliminary safety analysis report, v. 7, Section 2.5.H.1, Appendix, A report on geochronological investigations of materials relating to studies for the Philippine Nuclear Power Plant Unit 1. Hall, M.L., 1990, Chronology of the principal scientific and governmental actions leading up to the November 13, 1985 eruption of Nevado del Ruiz, Colombia: Journal of Volcanology and Geothermal Research, v. 42, p. 101-115. Hoblitt, R.P., and Kellogg, K.S., 1979, Emplacement temperatures of unsorted and unstratified deposits of volcanic rock debris as determined by paleomagnetic techniques: Geological Society of America Bulletin, v. 90, p. 63-642. Lockhart, A.B., Marcial, S., Ambubuyog, G., Laguerta, E.P., and Power, J.A., this volume, Installation, operation, and technical specifications of the first Mount Pinatubo telemetered seismic network. Mileti, D.S., Bolton, P.A., Fernandez, G., and Updike, R.G., 1991, The eruption of Nevado del Ruiz volcano, Colombia, South America, November 13, 1985: Washington, D.C., National Academy Press, Natural Disaster Series, v. 4, 109 p.
Murray, T.L., Power, J.A., March, G.D., and Marso, J.N., this volume, A PC-based realtime volcano-monitoring data-acquisition and analysis system. Newhall, C.G., and Endo, E.T., 1987, Sudden seismic calm before eruptions: illusory or real? [abs. ]: Hawaii symposium on how volcanoes work [abstracts volume]: Hawaiian Volcano Observatory, U.S. Geological Survey, p. 190. Peterson, D.W., and Tilling, R.I., 1993, Interactions between scientists, civil authorities, and the public at hazardous volcanoes, in Kilburn, C.R.J., and Luongo, G., eds., Monitoring active lavas: London, UCL Press, p. 339-365. PHIVOLCS, 1988, Distribution of active and inactive volcanoes in the Philippines: Quezon City, PHIVOLCS, educational poster, 1 sheet. Punongbayan, R.S., 1987, Disaster preparedness systems for natural hazards in the Philippines: An assessment, in Geologic hazards and disaster preparedness systems: Quezon City, PHIVOLCS, p. 77-101. Punongbayan, R.S., Rimando, R.E., Daligdig, J.A., Besana, G.M., and Daag, A.S., 1991, The July 16 1990 Luzon earthquake ground rupture, in The July 16, 1990 Luzon earthquake: A technical monograph: Manila, Department of Environment and Natural Resources, p. 1-32. Punongbayan, R.S., Sincioco, J.S., and Newhall, C.G., 1993, Pinatubo Volcano Observatory: Naples, WOVO News, Quarterly Newsletter, no. 1, p. 9-11. Ramos, A.F., and Isada, M. G., 1990a, Emergency investigation of the alleged volcanic activity of Mount Pinatubo in Zambales Province: unpublished letter to Gov. Amor Deloso, Zambales Province, 1 p.
------1990b, Emergency investigation of the alleged volcanic activity of Mount Pinatubo in Zambales Province: Quezon City, PHIVOLCS, Memorandum Report, 2 p.
Sabit, J.P., 1992, Pinatubo Volcano's 1991 eruptions: Paper presented at the International Scientific Conference on Mt. Pinatubo, 27-30 May, 1992, Manila, 34 p.
Simkin, T., 1993, Terrestrial volcanism in space and time: Annual Review of Earth and Planetary Sciences, v. 21, p. 427-452. Sorensen, J.H., and Mileti, D., 1987, Public warning needs, in Gori, P.L., and Hays, W.W., eds., The U.S. Geological Survey's role in hazards warnings: U.S. Geological Survey Open-File Report 87-269, p. 9-75. Tayag, J., Insauriga, S., Ringor, A., and Belo, M., this volume, People's response to eruption warning: The Pinatubo experience, 1991-92. Tilling, R.I., 1989, Volcanic hazards and their mitigation: Progress and problems: Reviews of Geophysics, v. 27, no. 2, p. 237-269. UNDRO/UNESCO, 1985, Volcanic emergency management: Geneva, UNDRO/UNESCO, 86 p.
Voight, B., 1990, The 1985 Nevado del Ruiz volcano catastrophe: anatomy and retrospection: Journal of Volcanology and Geothermal Research, v. 44, p. 349-386 (initially published, with errors, v. 42, p. 151-188).